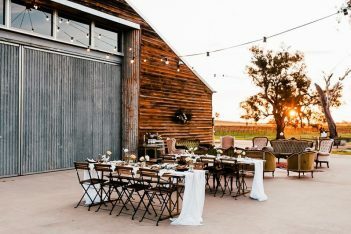 Racine Restaurant’s Apple Packing Shed is a rustic and romantic space for up to 150 guests; set on a working vineyard in the picturesque Orange wine region. This is a venue that appeals to foodies and lovers of wine as the food comes directly from the restaurant kitchen of Racine Restaurant, an award winning restaurant famed for excellent food and service. There are no function type menus, you actually pick your menu directly from the restaurant menu. The Apple Packing Shed has its own private courtyard garden for canapés, as well as a stunning 70 year old oak tree to have your ceremony under. Apart from the award-winning food, you will also receive fine dining service for all your guests, including tray service during canapé hour and table service during dinner. Finally, we offer an in-house planning and set up, so all you do is turn up on the day and enjoy. No setting tables or hanging fairy lights the morning of your wedding. Racine is the most complete vineyard dining/wedding experience you will find in the region, encompassing fine dining food and service with a stunning vineyard location. Racine is owned by husband and wife Willa & Shaun Arantz who have run a fine dining restaurant and wedding business for 10 years, adding an organic artisan bakery five years ago and opening The Apple Packing Shed early in 2016. They were married themselves at Racine in 2009 and have since had three children. Shaun is a chef by trade and Willa’s background is marketing and events working for some of Sydney’s best events and hospitality companies. Shaun worked in many fine dining restaurants across Sydney and London before opening his own restaurant with Willa in 2006. He has received multiple accolades as a chef, including 4 chefs hats, and was named Country Style Magazine’s Chef of the Year in 2012. 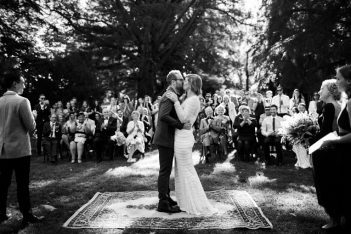 It is still very much a family run business with Shaun still active head chef of the Restaurant and Willa running all the weddings, from your first meeting to your first dance. They both love what they do and can’t wait to get to work everyday. Both are driven to make Racine better and up to date in every way, so the business and venue are constantly evolving and staying current.